Source: [http://commons.wikimedia.org/wiki/Main_Page Wikipedia Commons]'']] John III Sobieski (<em>Jan III Sobieski</em>): King of [[Poland|Poland]] 1674-1696; born 17 August 1629 in Olesko, the son of Jakub Sobieski (1580-1646) and Zofia Teofilia née Daniłowicz. John Sobieski became a military commander and after the death of Michał Korybut Wiśniowiecki (1640-1673), King of Poland, he was elected to the throne the following year. John III Sobieski died 17 June 1696 in Wilanów, Poland, and was succeeded by [[Augustus II, King of Poland (1670-1733)|Augustus II]].
'']] John III Sobieski (<em>Jan III Sobieski</em>): King of [[Poland|Poland]] 1674-1696; born 17 August 1629 in Olesko, the son of Jakub Sobieski (1580-1646) and Zofia Teofilia née Daniłowicz. John Sobieski became a military commander and after the death of Michał Korybut Wiśniowiecki (1640-1673), King of Poland, he was elected to the throne the following year. John III Sobieski died 17 June 1696 in Wilanów, Poland, and was succeeded by [[Augustus II, King of Poland (1670-1733)|Augustus II]]. Hege, Christian and Christian Neff. <em>Mennonitisches Lexikon.</em> Frankfurt &amp; Weierhof: Hege; Karlsruhe; Schneider, 1913-1967: v. II, 431. Hege, Christian and Christian Neff. <em>Mennonitisches Lexikon.</em> Frankfurt &amp; Weierhof: Hege; Karlsruhe: Schneider, 1913-1967: v. II, 431. Hoop Scheffer, Jacob Gijsbert de. Inventaris der Archiefstukken berustende bij de Vereenigde Doopsgezinde Gemeente to Amsterdam. 2 v. Amsterdam: Uitgegeven en ten geschenke aangeboden door den Kerkeraad dier Gemeente, 1883-1884: II, No. 697. Hege, Christian and Christian Neff. Mennonitisches Lexikon. Frankfurt & Weierhof: Hege; Karlsruhe: Schneider, 1913-1967: v. II, 431. Neff, Christian and Richard D. Thiessen. "John III Sobieski, King of Poland (1629-1696)." Global Anabaptist Mennonite Encyclopedia Online. October 2007. Web. 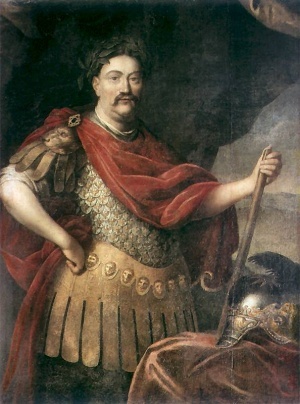 25 Apr 2019. http://gameo.org/index.php?title=John_III_Sobieski,_King_of_Poland_(1629-1696)&oldid=92153. Neff, Christian and Richard D. Thiessen. (October 2007). John III Sobieski, King of Poland (1629-1696). Global Anabaptist Mennonite Encyclopedia Online. Retrieved 25 April 2019, from http://gameo.org/index.php?title=John_III_Sobieski,_King_of_Poland_(1629-1696)&oldid=92153.